We were so excited when the twins appeared. Now they are turning a beautiful red. They were also joined by some nice neighbors. Our garden has really struggled with production this year so we are really celebrating the small victories. We now have at least a few tomatoes on each of our five plants, but it is pretty sparse. The twins’ plant is showing the greatest potential for bounty. 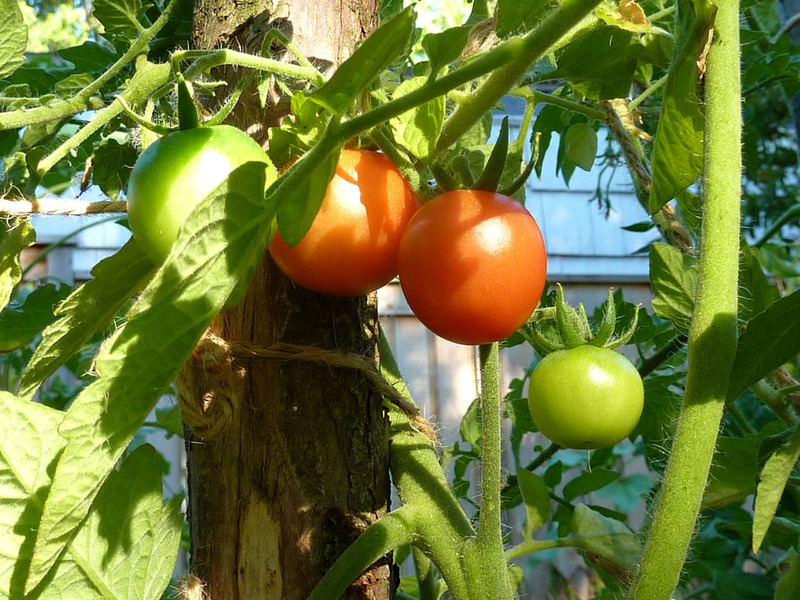 Last year’s tomato plants ran out of nutrients just as the tomatoes were transitioning to red. We only got two zucchinis and no peppers. We did not know there was a problem until it was too late. This year we have been adding soil amendments on schedule, but the summer squash and peppers are still lagging. All our hopes are tied to the tomatoes right now. I am so hoping to have enough tomatoes to make my favorite summer soup from Bryant Terry’s Vegan Soul Kitchen. I fell in love with it last summer and have been dreaming about it since then. I hope that you have been enjoying delicious food from your garden or, that you are still holding out hope for what is still to come. This entry was posted in Beauty, Eat, Food, Grow, Learn, Read, Seasonal. Bookmark the permalink. This entry was posted in Beauty, Eat, Food, Grow, Learn, Read, Seasonal, Uncategorized. Bookmark the permalink.